Tyent water ionizers are low maintenance, but some maintenance is required to ensure that the best quality water is continually produced and to ensure long term performance. These are basic maintenance procedures that are required with any water ionizer. Depending on the volume of water produced and whether or not you are using a pre-filtration system, you’ll need to change the filters inside your Tyent water ionizer once every six to nine months. Both Tyent countertop models and Tyent’s under the counter water ionizer will always display the filter life so that you have a good idea how much longer your filters will last. At the end of the filter life, Tyent water ionizers give both audio and visual alerts letting you know that it’s time to change the filters. To replace the filters you’ll need to open the panel to the filter area. On countertop models the filter panel is on the back of the unit with a panel door release on the side. On the under counter model, the filter area is accessible from the front of the unit under the counter – the entire front door swings open from a release on the left side of the unit. Removing one filter at a time is a good way to make sure you don’t forget which filter goes in which position. Remove one filter, replace it – then remove the other filter and replace it. You may want to allow the old filters to drain in the sink for a short time before throwing them away – they will have water inside. Once the filters have been replaced, close up the filter area – replacing the filter panel on the countertop model or closing the front panel on the under counter model – and then you’ll need to reset the filter life indicator using the control panel. Resetting the filter life indicator is slightly different depending on which model you have. You’ll find instructions for doing this in your user manual. Once the new filters are installed and the filter life indicator is reset, your Tyent water ionizer will be ready to start producing clean, ionized alkaline and acidic water. The automated cleaning cycle on Tyent water ionizers reduces scale buildup inside the electrolysis chamber by repeatedly reversing the polarity of the electrodes. This process combined with the water flowing through the chamber during cleaning helps “shake loose” mineral scale, slowing excess buildup and flushing it from the system. While effective at slowing scale buildup, because an electrical charge is being used during this type of cleaning, some minerals will still cling to the electrodes. Also, this cleaning process does little to address scale buildup that often occurs inside the dispenser hose. For this reason, Tyent recommends using a cleaning cartridge once every 12 to 18 months – or once every 6 to 9 months in hard water areas. The cleaning cartridge releases citric acid into the water going through the electrolysis chamber and dispenser hose. This “citric acid water” releases minerals from the electrodes and inside the dispenser hose and flushes it from the unit. Using the cleaning cartridge is easy and requires no special tools. Simply remove the filter in the second position – the ceramic filter – and replace it with the cleaning cartridge. If your water ionizer is connected directly to the faucet, set the water temperature to hot. Not scalding – just hot, the temperature you use when washing dishes. If your water ionizer is connected directly to the cold water line or if you have an under-counter model, using the cleaning cartridge with cold water is also effective. Depending on how long it has been since you have cleaned your unit and the hardness of your water, you may want to use the “soak” procedure to ensure maximum scale removal. Once the cleaning cartridge is in place, turn the unit on at the “H2O” setting and allow the unit to run for up to 30 minutes. Tyent water ionizers will automatically shut off after 15 minutes use to prevent overflow – so you will need to check back in 10 to 15 minutes to restart the unit. After 20 to 30 minutes, switch the water temperature back to “cold” and allow the unit to run at the H2O setting until the water coming from the dispenser hose is cold – or the same temperature as the “cold” water that comes from your tap. When the water coming from the unit returns to the normal temperature, turn the unit off, remove the cleaning cartridge and reinstall the #2 ceramic filter. Close the filter area, and run the unit at the H2O setting for another minute or two to flush the unit and your Tyent cleaning is complete. If you are using cold water with the cleaning cartridge and want to allow the unit to soak, allow the unit to run for 5 minutes at the H2O setting and then turn it off. For under counter models, turning it off and allowing the unit to soak for up to an hour is fine. For counter top models, you’ll want to plug the acidic drain hose to prevent water inside the chamber from draining. You can use anything that fits over or into the drain hose that can be easily removed then allow the unit to soak for up to an hour. After the unit has soaked, restart it using the H2O setting – be sure to remove any plug you may have used to block the acidic drain hose. Allow the unit to run at the H2O setting for another 10 to 15 minutes before removing the cleaning cartridge and reinstalling the #2 ceramic filter. Once the #2 ceramic filter is back in place be sure to flush the unit for a minute or two at the H20 setting. 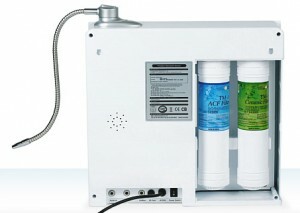 I´d like to know where I can buy this water ionizer filter and the price to pay.